I’m trying to work up a recipe for a group of friends that are planning on a visit. I want the dish to be impressive, but with little working time from me while they are here. Thus a make ahead preparation is crucial. So I decided to sous vide a pork tenderloin. I cut it into medallions, and tied it with kitchen twine to keep it’s shape. I marinaded it overnight with salt, pepper, thyme, apple cider, and maple syrup. Then 3 hours before dinner I put it in a sous vide water bath set at 138F for 2-1/2 hours. Meanwhile I made a yummy ‘salsa’ to put over top of red onion, garlic, parsley, maple syrup, and apple.. and I finished it with a teaspoon of butter. Then I pulled the cooked pork from the food saver bag and took the twine off. I rolled it in a harissa seasoning, then seared the edges in butter just to brown. Then topped it with my apple mixture. YUM! I would definitely make again. 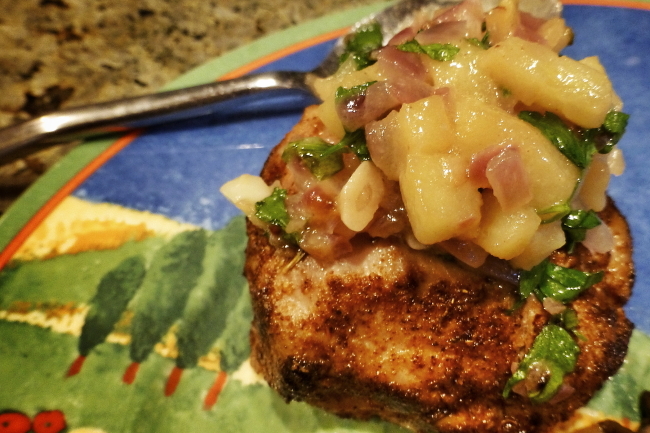 I loved the butter lusciousness of the apples with the tender juicy pork. It was excellent. This entry was posted in What's For Dinner and tagged apple, medallions, pork, sous vide, tenderloin on December 23, 2014 by kritterspaw.